…at places you don’t expect.. I have been on a quest to find a good shaker for both my protein shakes and my Results&Recovery Formula for a long time now. I tested a lot of shakers, from the cheapest plastic ones from the local grocery store to expensive and complicated thingamajigs from official body-building stores for which you almost need a manual in order to use (or clean for that matter). Either those things couldn’t even get through a simple session of shaking without spilling liquid all over or it took 15 minutes to take the things apart, clean then again about 15 minutes to figure out how to put the thing together again. Funny enough, Henning found the perfect shaker for me in the most unlikely place: Starbucks! The only shaker that passed all those (really not asking for much) criterias was said shaker from Starbucks. That one comes even with the added bonus that you can use it to keep your hot beverage warm (which it is in fact intended to do). 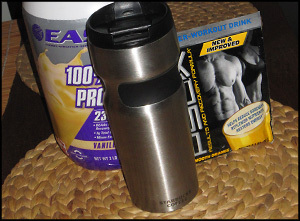 Do you ever actually put your protein/supplements in hot drinks? Every scoop of whey protein I’ve added to hot coffee has turned into a weird styrofoam blob. It’s almost like a chem lab experiment. Haha, no I have not. Sounds like fun though!